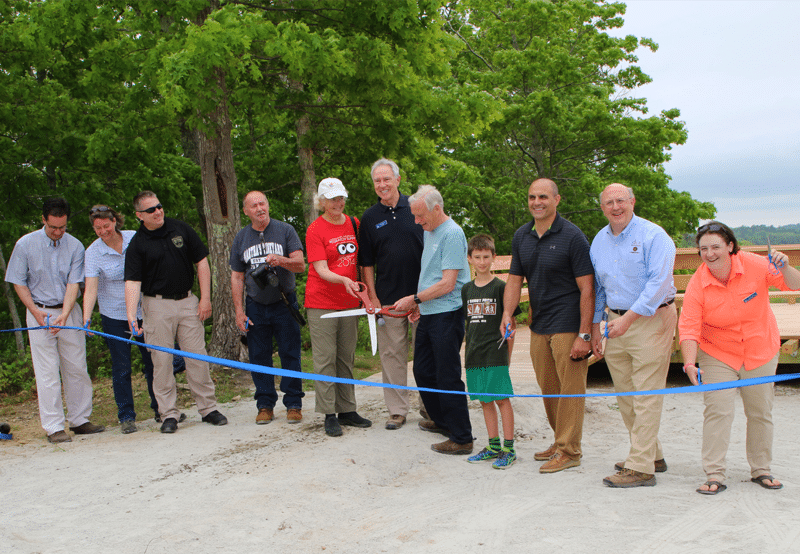 Partnering with the Mass Audubon Society, the Charter Team volunteered its time and services to construct a 500-foot long gravel walking path and 330-foot wooden observation deck at Tidmarsh Wildlife Sanctuary in Plymouth, MA. Mass Audubon’s new Tidmarsh Wildlife Sanctuary is situated on a former Plymouth cranberry bog that was restored to its original freshwater wetland habitat. The 480-acre wildlife sanctuary offers three miles of trails that invite Mass Audubon members and the general public to discover a protected oasis located within one of the most development-intensive corners of the state. On Saturday, June 2nd, Charter had the distinct privilege of celebrating with the community at the ribbon cutting for the public opening (pictured below), continuing the Audubon Society’s mission to Protect the Nature of Massachusetts. We were honored to be a part of this ceremony and to work with the Audubon Society, an organization that shares our core values and mission— to protect and rebuild the natural environment. We hope the local community and the public-at-large enjoy the Sanctuary and all it has to offer!